Just in time for spring, go ahead and crack open a page-turning new book — or download it on your device. There’s a lot to choose from when it comes to riveting reads, so we enlisted two acclaimed authors to help us pick the best of the best. 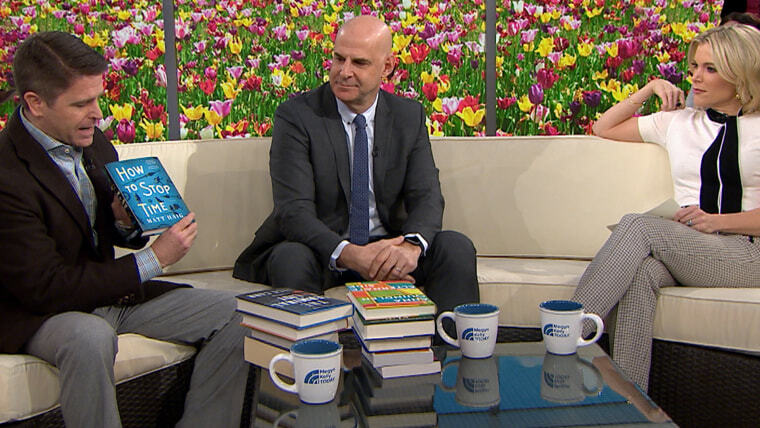 Mystery writer Harlan Coben and thriller pro Brad Thor are here to help satisfy every bookworm’s tastes with new releases and beloved classics. Thor recommends "How To Stop Time" by Matt Haig, which "has a fascinating premise about a man with a rare disorder that prevents him from dying. A secret society protects him (and others like him), but has one important rule: Don’t fall in love." Coben, meanwhile, is a fan of "Alternate Side" by Anna Quindlen. "She is one of my favorite writers, and her new novel is about a seemingly perfect marriage and how one act of violence rips through everything. This is a novel about being a mother and a wife and how fragile it all can be, yet in the hands of a master, we see the strength and optimism too." Thor is all about “The Terminal List” by Jack Carr, which he called an “an incredible debut thriller! It’s a white-knuckle thrill ride about a team of elite military operators caught in a suspicious ambush. The last survivor among them vows to get to the bottom of what happened and carry out revenge on their behalf." Thor raves about “The Serpent's Secret” by Sayantani DasGupta. "Kiran’s 12th birthday starts with her parents missing and a demon crashing into her kitchen in New Jersey! Suddenly, the tales her mom and dad told her about the far-off, magical place that they are from don’t sound so unbelievable anymore," he said. Coben is all about “Truly Devious" By Maureen Johnson. “In 1936, a still-unsolved murder and kidnapping occurred at the prestigious Ellingham Academy. Now, in the present day, another murder is committed at the academy and student Stevie Bell is trying to solve both crimes. The first in a trilogy, this one ends on a cliffhanger,” he said. Thor loves “The Girl in the Spider's Web” by David Lagercrantz, who has taken over the series for Stieg Larsson about world-class hacker Lisbeth Salander and investigative journalist Mikael Blomkvist. "It has action, intrigue, spies and betrayal packed in every chapter," he said. Coben is into Jason Matthews' “Red Sparrow," which was turned into a film starring Jennifer Lawrence, saying it's "a classic spy story with double agents and double crosses. The author, who is retired CIA, clearly knows his stuff. Don’t trust anyone!" Thor adores “The Count of Monte Cristo” by Alexandre Dumas. “This is the original cliffhanger thriller and one of my favorites! Did you know it was serialized in a French newspaper in order to get people to come back and buy the next edition of the paper?” he said. Coben can’t get enough of “American Pastoral" by Philip Roth, who is his “all-time favorite author. This book is important in so many ways; it's about family; it's about a father and a daughter; it's about expectations and revolutions and the generation gap. It's a tragedy that will teach you more about the Newark and the riots of the '60s than any history book."